Slightly modern and clean in understated design, this platform bed is a fantastic sleeping centerpiece for the bedroom in your home. 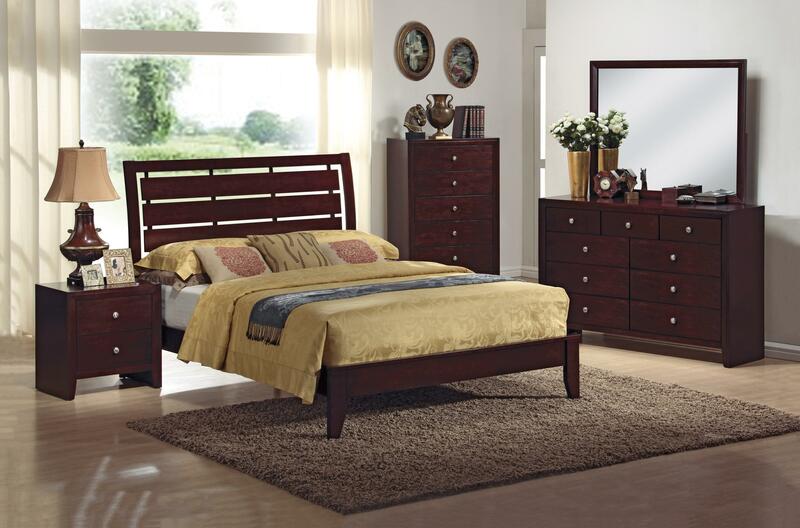 Featuring a low profile footboard with slightly tapered feet, and a softly curved headboard with slat cutouts, all completed in a deep brown finish, this classy bed is a smart furniture choice for the bedroom in your home. This bed is available in Queen, King, and California King size. Add a classic furniture combination to the bedroom in your home, with this clean and understated dresser with mirror pairing. This piece features a raised base with nine spacious storage drawers in two different sizes, outfitted with silver burnished knob pull hardware, and geometric styling, making it functional, rich, and fashionable. The rectangular landscape mirror in this combination adds the feeling of light and space to your home and completes this longstanding furniture duo. Clean and understated in design, this nightstand provides functional bedside storage for your home. It features a raised base with two spacious storage drawers outfitted with silver burnished knob pull hardware, and geometric styling. 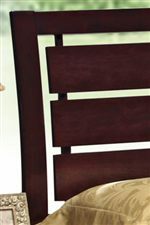 This piece is functional, rich, and fashionable and adds smart storage and sleek furniture to the bedroom in your home. The Evan 4 Piece Bedroom Group by CM at Michael's Furniture Warehouse in the San Fernando & Los Angeles area. Product availability may vary. Contact us for the most current availability on this product.